DENVER, Aug. 22, 2018 /PRNewswire/ -- Chipotle Mexican Grill (NYSE: CMG) announced today that the Chipotle Cultivate Foundation will sponsor the first Chipotle Aluminaries Project, a seven-month-long accelerator program designed to help growth-stage ventures with a shared vision to cultivate a better world take their businesses to the next level. Beginning September 12, food-focused companies may submit applications to join a cohort of ventures that will receive mentorship and direct coaching from world-renowned industry leaders, participate in a boot camp, receive a Chipotle celebrity card and of course, be fueled by Chipotle catering throughout. "Chipotle has been committed to the future of food with integrity since opening our first restaurant 25 years ago," said Brian Niccol, chief executive officer at Chipotle. "Since then, Chipotle and its Foundation have changed how customers and the industry think about food, which is part of our mission to cultivate a better world. By sponsoring the Chipotle Aluminaries Project, we're looking to advance the work of the next generation of entrepreneurs who are disrupting the food landscape. Are you using technology to make an impact? Are you dreaming up the next sustainable food innovation? If so, we want to support you and help share your story." The Chipotle Aluminaries Project is seeking applicants (both for and non-profits) in the areas of alternative farming and growing systems, farming and agriculture technology, food waste and recovery, and plant and alternative products. After reviewing submissions and talking with candidates, Uncharted, the non-profit 501(c)(3) partner selected by the Chipotle Cultivate Foundation to host and run this accelerator, will select up to eight ventures to join the first cohort. The selected ventures will participate in a five day, in-person boot camp in Newport Beach, California, with direct coaching to build their plan for scale. Plus, they will receive real food to fuel late work-nights with monthly Chipotle catering for their office and a Chipotle celebrity card, because Chipotle believes these entrepreneurs deserve celebrity status. "The Chipotle Aluminaries Project is part of a fresh perspective from the Chipotle Cultivate Foundation, which we founded in 2011 to extend our commitment to creating a more sustainable food future," said Caitlin Leibert, director of sustainability at Chipotle. "Chipotle believes that philanthropy is more than check cutting, and this is the first of many efforts from the Cultivate Foundation of investing in new ways." 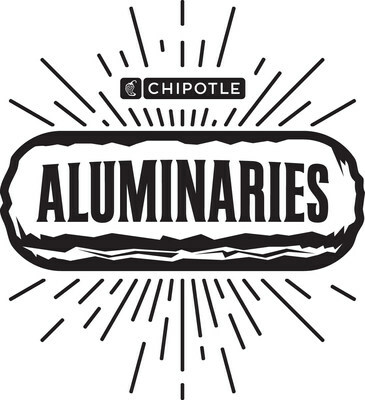 The Chipotle Aluminaries Project will be launched in partnership with Uncharted, a 501(c)(3) organization that uses the DNA of an entrepreneurial accelerator to tackle major social problems like urban poverty and food deserts. Uncharted has helped social entrepreneurs raise $252 million, create impact in 96 countries, and benefit 37 million lives. Companies interested in submitting an application for the Chipotle Aluminaries Project can find more information and apply here starting September 12.